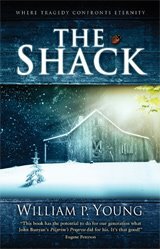 I’ve just finished reading William P Young’s ‘The Shack’ and, from looking on the web, can see that this this book has generated a lot of energy (including heat!). Somehow I had missed all this and only became aware of the book when I saw it by chance in W H Smith’s in Manchester Airport when we were flying out to Hungary in August to help with a children’s mission. So I had no preconceptions about it and avoided all the hype. I’m not going to go into detail about the story for fear of spoilers – but from my own perspective I would definitely recommend it. You need to keep objective though – it is just a story. It’s not scripture or necessarily even great literature (though Eugene Peterson in his endorsement suggested that it ‘has the potential to do for our generation what John Bunyan’s Pilgrim’s Progress did for his. It’s that good!’). Indeed theologically it may at times veer into unorthodoxy (lack of hierarchy in the Trinity for one). But, in my view, that’s to miss the point. This is where I tread on thin ice. At times it is possible for people of faith (I hate the word religious) to aim to be so right that they become wrong. Twenty years ago I would have described myself as a card carrying evangelical – but the older I get, the more I realise that all our systematic understandings of theology are at best only approximations of truth. It’s not what you know or believe but who you know that matters in the end. Transformation comes through relationship with The Father/ Son/ Holy Spirit and fellow believers on the Way. Life is a journey – you don’t arrive when you become a Christian, you walk through a door. In God’s eyes some significant things happen but the work of transformation continues. I will shortly be leading an Alpha Group (for new christians/ seekers) and my instincts are, while pointing them toward scripture, to recommend it. Sometimes the heart needs to lead the head. In human terms if the blood flow stops the brain dies. Increasingly we are having to think about new ways of getting the gospel across to people. There’s still a place for solid bible study (neglected I would argue) but that, for many people, comes later in the journey. Once again, the heart of the Christian faith is a relationship not a list. We are not under law, we have grace to enter. The 2008 AGM of the George MacDonald Society will be held at Temple Lodge, Hammersmith on Saturday 11 October 2008. In the afternoon we are invited to visit Kelmscott House (formerly The Retreat) by courtesy of the owners, Mr & Mrs Birney. The exact time of the visit is to be confirmed, but numbers will be limited to 15. Those wishing to visit The Retreat should contact Richard Lines who will take names on a first come, first served basis. Mrs Birney has very kindly offered to provide tea afterwards. The exact time of the visit will be confirmed in September. We understand that Temple Lodge cannot provide lunch that Saturday, but will check out the local pubs. There are several nice ones on the river.